Melanie Turner—twice named Southeastern Designer of the Year—arrived as a sort of style-savvy Mary Poppins for the makeover, toting fabric swatches instead of an umbrella. Priority number one: Erase the bland 1990s color palette, with its honey-colored floors and dark kitchen cabinets. Existing floors were sanded and restained a walnut shade; walls and kitchen cabinets were painted white for contrast. Marble kitchen countertops and an all-white master bath contributed to the crisp new look. 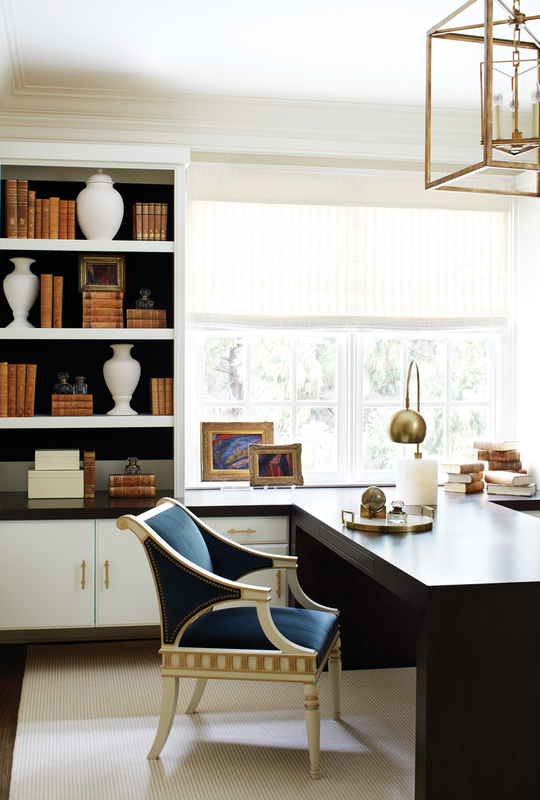 A partners desk—meant to accommodate two people—and built-in bookcases create a chic office in an open area upstairs. The desk was custom-made by Atlanta-based Fancy Woodworks. 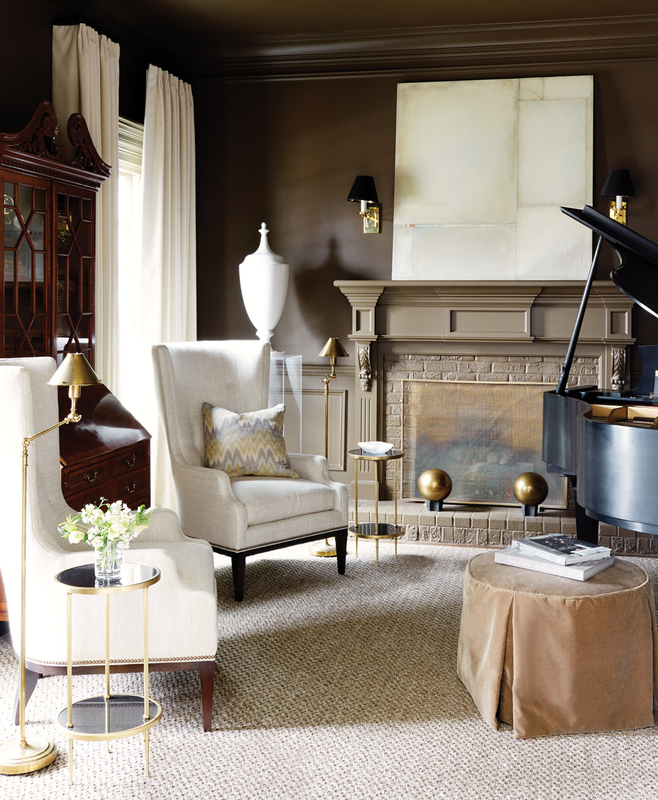 In the living room, an abstract painting by Steven Seinberg from Pryor Fine Art and symmetrical plum-colored settees establish the color scheme. To cozy up the two-story space, designer Melanie Turner created two seating areas and enclosed some of the open bookshelves with cabinet doors. 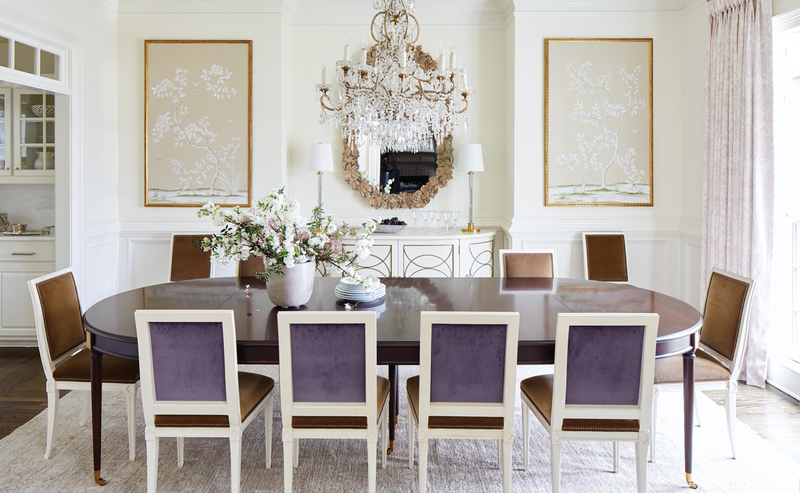 “We wanted the look of wallpaper in the dining room, so we hung the Fromental silk panels in bamboo brass frames,” says Melanie. Dining table and chairs are by Hickory Chair. Shades of plum appear in window treatments, pillows, and upholstery. In the dining room, chair backs are covered in an elegant aubergine velvet, which complements a lavender-toned rug and purple drapery. Melanie ordered two plum velvet settees as focal points for the living room. An abstract painting and chunks of amethyst geodes bring in more purple tones. Elsewhere in the room, an understated linen sofa, brass bamboo coffee table, and sisal rug keep the look casual. “We dressed the room down but still kept it pretty,” says Melanie. Linen-covered barstools offer comfortable seating in the now-white kitchen. A collection of ballet art has antiqued mirror frames. Melanie also helped the Plumbs expand their art collection. Where it made sense—such as in the two-story living room—Melanie chose large-scale pieces. But in other areas, they arranged collections of smaller works, such as a grouping of stylized face portraits in the front hallway, or an arrangement of nudes in the master bedroom. Because Renee is a former dancer, the master bath includes a collection of ballet-themed art.